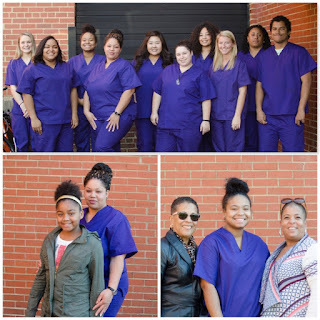 The medical field is an ever growing career opportunity, and this is especially true in Richmond, VA. Positions can't be filled quickly enough and if you're a qualified individual with a CNA certification you won't have too much of a hard time finding a job. Yes, you do have to come from a good school and no this type of job is not for everyone. What we can tell you though is that if you're a hard working individual that is looking to make more money, this could be a great opportunity for you! Our program is less than $1,200. You read that correctly! It's much cheaper than a lot of the programs that local universities offer and because we are a smaller school that ONLY specializes in CNA and Med Tech, you receive individual attention that you wouldn't otherwise get anywhere else. We also offer payment plans to accommodate budgets of all sizes. The program takes a total of five weeks. It can be intensive and a little tiring but you'll be in and out before you know it. You get to know your teachers and peers really well and once you come here, we consider you family. This is another reason why offer a cash reward for each one of your referrals. Every student that you refer to us will earn you $25.00. There is no limit to how many of these credits you get and you don't even have to be enrolled anymore, so this applies to our graduates too! When we see a student excel in our program we'll make sure we refer them to employers so they can easily find a job. No other school in the area offers the kinds of connections we have, in fact, hospitals and patient care facilities look to us for our brightest students. Graduating with job security in five weeks is something that you won't find anywhere else. We are now enrolling in classes for 2017! What are you waiting for? Call today and enroll! Join the Virginia School for Nurse Aides team!